[Fishing] 'Bottle with a Note' item - Also possible to obtain when fishing. Details and location. fishing [Fishing] 'Bottle with a Note' item - Also possible to obtain when fishing. Details and location. Got one recently but it has me stumped, quite the long riddle and badly translated apparently. I caught my breath in a small shade. I was walking towards burning camel at infinite time. When it was less than 100 steps, I found myself standing in a hard and cozy nest. "With that I have in my bag, I will rule the world! Stupid natives did not even guess what value this was! but it was already exhausted. I'll dig a load here, under the tree. I hope I can hide in the valley of Titum"
I have a feeling that the two new Garduka Treasure Maps introduced recently, with the new English clues (note that on BDDatabase there are other blank maps yet to have text added, presumably for later new quest maps) are actually different text but using the existing locations. "С тем, что у меня в сумке, я буду править миром! Глупые туземцы даже не догадывались о том, какая это ценность! Главное оторваться от погони... В святилище Скромности мне дали неплохую лошадь, но она уже выдохлась. Закопаю груз здесь, под деревом. Надеюсь, я смогу скрыться в долине Титума. " "With what I have in my bag, I will rule the world!" The stupid natives did not even know what that value was! The main thing was to break away from the chase ... In the Sanctuary of Modesty I was given a good horse, but it was already exhausted. , Under a tree, I hope I can hide in the valley of Titum. " This is the location from a KR location map (using the original graphic with added text) which is located at the bottom right location, which ties into the locations named (see earlier posts on this) from the location map I posted before. However it seems players have had trouble with that one. С тем, что у меня в сумке, я буду править миром! Глупые туземцы даже не догадывались о том, какая это ценность! Главное оторваться от погони... В святилище Скромности мне дали неплохую лошадь, но она уже выдохлась. Закопаю груз здесь, под деревом. Надеюсь, я смогу скрыться в долине Титума. " It's possible it is just a mistake or issue with BDDatabase data entry mixed up but also possible they use the same locations. However, they other new clue also uses an existing Russian translation (see below) so it seems two mistakes in the database or it is the same locations just new quests. Unfortunately, this appears to be the one location shown in the BDDatabase for Golden Treasure Chest, which players have had problems finding. All the other four locations match exactly the actual map location and chest items found. Still not sure why. "Туземцы не отстают! Наверное, не стоило воровать их святыню. Чёрт, как болят ноги... Где я? Могила мучеников? Закопаю всё здесь, и вернусь потом. Нужно как-то убежать от погони..."
"The natives do not lag behind! Probably not worth stealing their shrine." Damn, how aching are the feet ... Where am I? Tomb of the martyrs? I'll bury everything here, and then come back. "We must somehow escape the chase ..."
The same text as above. Note also that this existing EN version doesn't have a RU translation currently in the BDDatabase. ”For I lack four fingers - four skies and four lands. Punctured the neck of the thirsty and let the spring water run through it. I suggest to check the locations from the location map posted earlier for the locations using the same RU text as the most likely locations. There are no new Golden Treasure Chest locations in the database, though they could use different names. But the above suggests they simply used existing spots. @Moonraker You're most likely correct, I will venture out to Valencia and start digging and confirm the location sometime soon. No luck at the Humility and Pilgrim Haven digsite, gave both spots 200 shovels to no avail. Like I said above, it is the one spot (under the tree) where no one has found the treasure, even though it is right on the BDDatabase location (see links etc. to view the map and I posted a detail map extract before of it. And also the KR location image I used for that map. it is the right location based on all that but simply not working like the others. I have a suspicion the item is not functioning correctly based on the fact all the others are. Read the thread and players have tried a lot there and even on the RU locations route between. The mention of a tree gives even more of a clue but just doesn;t seem to work currently. It wont be found at another location I very much doubt. Not that the other new clue may be found where players have found the item so that should work. I would make a ticket at least and ask. I suspect they will just say it is a mystery blah blah but the reason why this one spot doesn't seem to work I can't find a reason so far. If it is broken or misplaced or texts not right (even right the EN texts are mostly totally useless to pinpoint the places as it is, we rely on RU and BDD for that) then it's the only way forward sadly and now two quests point to it. I read other's posts as well, though im hard to give up but it feel like this location is bugged or the quest itself isn't working properly. Shame it isn't, I will probably come back later when my energy is restored and keep digging around the area. If i manage to find it I will report back here ASAP. It would be nice if one of the GMs could confirm if this particular digsite is working properly or if we're just havent found the correct spot. @CM_Aethon or @PM_Jouska if you could possible comment or relate this problem to someone who might be able to clarify our current predicament that would be lovely. First off huge thanks to all who're contributing to this thread in finding the locations to these clues, especially with all the confusion surrounding the differences between RUS and US. I finally got my treasure for the ”For I lack four fingers - four skies and four lands. Punctured the neck of the thirsty and let the spring water run through it." Quest. 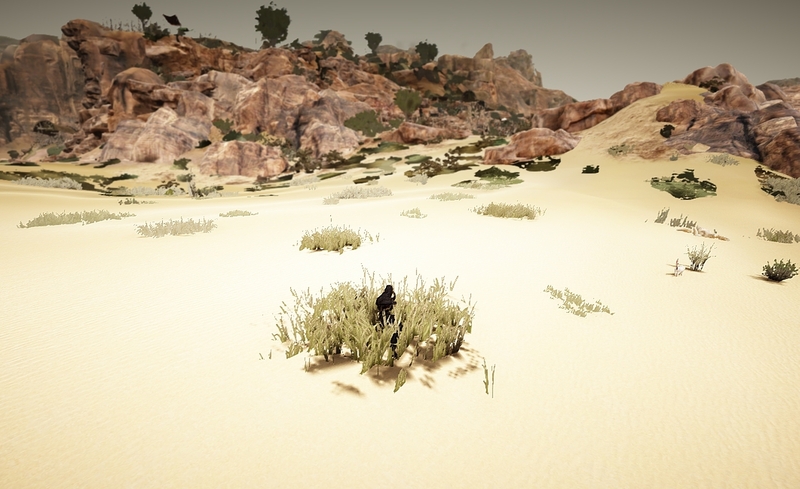 I used the map posted earlier with the mini screenshots and I have my own SS to add now, at first I was digging too close to the cactus dudes spawn. when i moved just NW of it enough to not proximity aggro I found it in a few shovels. Using the little tree/cactus guy that spawns NW of Pilgrim Sanctum: Sharing as a marker. The location I'm standing in my screenshot and was a little off both the two flags that correspond to the BDdatabase map for Gold Chests but I did not have a compass so maybe I am on one or the other. Again this is for the Hint : ”For I lack four fingers - four skies and four lands. Punctured the neck of the thirsty and let the spring water run through it." The pillar on the south side (or left side of the image) there are some pots you can get on, jump to pillar, jump to roof. I can confirm that the "three big bright stars" one isn't found on top of the sincerity shrine. Oh well worth a try. After a month, I finally got one! same, I tried under, on top and all around. There's a similar shrine at humility, tried that one too. this particular quest on hold until someone finds the correct location or until I fish up another bottle. 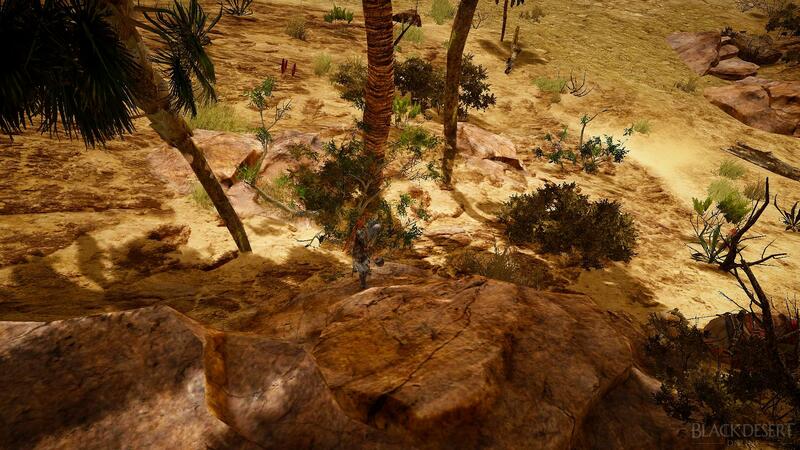 But I can confirm that it is NOT at the same location as the Aal's Grace clue in Pilgrim's Haven (as pictured here http://origin.webcdn.theblackdesertonline.net/forum/service_live/monthly_02_2017/2017-02-27_-1534936928.thumb.JPG.2126c810bd3d0332c16a92d1a30e5bcf.JPG). I tried about 20-30 shovels in that little area to no avail...please let me know if anyone solves this. There is no other clue other than it being exactly thew same RU version text, hence the assumption it is the same spot. The circle for digging if small like literally 1M diameter for all spots so be careful to dig in and around the spot to be sure. Moving even 1-2 metres away results in nothing. If it is not there then there is no other option than trying to work out the vague clue. All that can be seen as discussed above it that no new locations were added to the database. But then they could use another name and there seems some issue with the other spot with none found. The other clues and spots all work and correlate to the database spots. With the RU version text and these is the only reason they were found at all. I wish you and others hunting for this/ these elusive spots. If I see anything on KR forums I'll post here. GL! Thanks to this, I also found this exact location. Sand spirit was good landmark. Latest KR patch has something to take notice of regarding the treasure hunt quests. I do like the digging areas have been slightly expanded. - Excavation area has been increased slightly, hints have been added to quest summary. - Upon quest completion, new knowledge with excavation site details has been added. 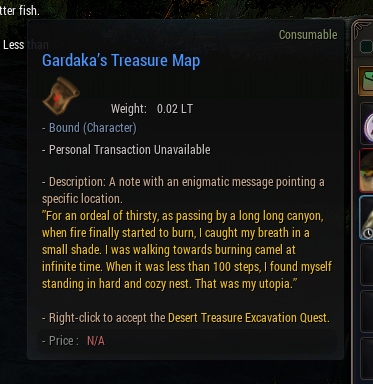 - 3 new Gardaka's Treasure quests have been added. Don't be like me and forget a step --- make sure you actually activate the quest item from the note in the bottle before digging - otherwise you'll never dig up the item. You probably already did activate it, but I figured it was worth mentioning, just in case. That would had been a huge oversight on my part but fret not, I did activate the quests and then dug. Its a shame that dig site is bugged(?) or just that we can't discover the exact spot to dig since I've fished out two more bottles as of lately with the same exact riddle. I may have the start of a clue for the ”Underneath the lonely lamp, lighting the sand, what do I sing for? Among all blue skins that are fallen off like a fragment, one painful nail that is the farthest from me.” one. http://bddatabase.net/us/theme/6768/ <- this knowledge may lead us to ancado coast maybe ? Gave that spot a few shovels, about 100 or so had no luck. Did you manage to dig up the treasure? I just got it, moved around slightly, ended up using maybe 50 shovels in all. I will have to return and try again, thanks for confirming though. Location confirmed They fixed it! Its the Titium Valley. Got it on second dig.